Immigration and visa information for foreign residents living in Mexico. Attention> As of November 9, 2012, the Mexican Migration Law and its Regulations entered into force and, along with this, new migratory provisions exist to enter Mexico. Requirements to obtain a visa also updated. Tourism, Transit, Business Trip, Correspondent of a means of communication, among others. Visitor visa without permission to perform paid activities. Visitor Visa without permission to perform paid activities, when requested for humanitarian reasons, in accordance with the assumptions set forth in these Guidelines, provided that the individual or institution that invites is in the national territory. Visitor Visa with permission to perform remunerated activities, when requested by a job offer. Temporary Residency Visa, when requested by job offer or by the family. In the case of the family unit, provided that the relative who gives them the right to the visa is in the national territory. Permanent Resident Visa, when requested by a job offer in the points system, by family or by derivation of recognition of refugee status. In the case of the family unit, provided that the relative who gives them the right to the visa is in the national territory. Below I will talk about the 2 most relevant visas for US and Canadian citizens living or wanting to live in Mexico. Applicable to foreigners who intend to enter Mexico in the condition of temporary resident in order to remain for more than 180 days and less than 4 years. Passport or identity document and proof current travel. Be a citizen of the country or prove legal stay in the country where the visa application is submitted. Present the documents that accredit any of the following assumptions: a) Economic solvency. b) Realization of scientific research in jurisdictional waters. c) Responsive letter. d) Family link (parents, minor children, spouses, concubines, minor stepchildren) with a Mexican or foreign person who has the status of Temporary Resident or holder of a Temporary Residence visa. e) Proof of real estate in Mexican territory. f) investments in Mexican territory. g) Are under the protection of an international legal instrument for the mobility of persons. VERY IMPORTANT: As long as the received salary is paid abroad. this type of visa can be requested directly at any consular representation in Mexico and allows the foreigner to work in our country. If you have an offer of employment in Mexico and receive your salary in Mexican territory, the company or employer must directly handle before the INM (Instituto Nacional de Migracion) the authorization for the issuance of a visa from abroad. NOTE: In any case, the foreigner must process within the following 30 calendar days counted from his entrance to the national territory, the residence card that accredits his legal stay and allows him to remain in Mexican territory. Be citizens of the country in which they apply for the visa or prove legal stay. Present the documents that accredit any of the following assumptions: a) Retired or pensioned. b) Family link (parents, minor children, siblings, concubines, minor stepchildren) with a Mexican or foreign person who has the status of Permanent Resident or holder of a Permanent Resident visa. In the case of spouse or concubine, you will be documented with a Temporary Residency visa. After fulfilling the condition requirements this must be maintained for 2 years and then apply to the Instituto Nacional de Migracion (INM) for your permanent resident card. Note: The residence card that proves your legal stay and allows you to remain in national territory must be processed within 30 calendar days from entry into national territory. Below is important information given during recent orientation by immigration officers concerning Safeguarding Visa Status When Leaving Mexico! Foreign citizens who have dodged through all the bureaucratic guidelines required to acquire residency visas in Mexico may run the risk of losing legal status whenever they venture out for travel beyond the country’s borders. Officials from the Instituto Nacional de Migration (INM) issued a warning during an expat meeting in Jalisco. 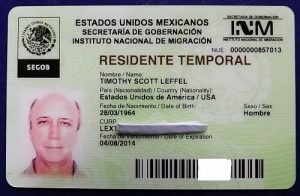 All it takes is a minor clerical error done when going through immigration stations at border crossings and international airports to end up getting automatically switched from Residente Temporal (RT) or Residente Permanente (RP) status to a visitor permit good for a maximum of 180 days. According to INM’s Chapala office chief Guillermina Cortés, at least a dozen lakeside area immigrants have lost their residency visas due to paperwork glitches when returning to Mexico from trips abroad. Essentially the problem stems from errors in processing the Forma Migratoria Multiple (FMM), a standard form that must be submitted individually by all foreigners entering and exiting Mexico. For tourists traveling beyond the border zone, the two-part FMM serves as their official visitor permit. Upon entry to Mexico, the larger top portion is stamped and collected by immigration officers with the lower segment handed back upon departure. In contrast, as an RT or RP visa holder, any time you fly out of Mexico you will have to fill out an FMM and give it to the airline carrier to be attached to your boarding pass. The shorter lower segment of the form will be collected at the INM desk prior to entering the boarding area. The tricky part is how the FMM is handled when reentering Mexico. Airline personnel most of the time hand out the forms on board the incoming flight. Residentes fill in the information boxes in the top portion of the form, including noting Mexico as the country of residence (box #7), the number shown on the back of the INM green card (box #8), checking otro/other for purpose of trip (box #9). 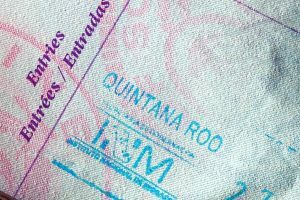 Immigration officers also recommend adding the hand-written notation Residente Permanente or Residente Temporal across the top of the form and detaching the lower portion of the form that is meant to be kept only by persons coming into the country as visitors. When unboarding the plane, pay attention as you go through the immigration filters. First of all, show the official your INM resident green card and passport and verbally state “soy residente.” Then hand over the top portion of the FMM. Cooperate with the official on duty if he insists that you fill out both segments of the form, but make sure that the gray areas designated for Uso Oficial are filled out properly before leaving the immigration desk. If there is a checkmark in the section labeled Estancia Maxima 180 days you will be registered as a visitor in the INM database, automatically losing your resident status. In that case, stand your ground to see that the mistake is corrected and the section below, titled “Unicamente Para Efectos Estadisticos,” is checked off in the box labeled Tarjeta Permanente Temporal. Resident immigrants need to follow the same procedures when leaving and entering the country by land or sea. Immigration officers also pointed out that RP and PT holders are not subject to any processing fees to airline companies or immigration checkpoints since they have already paid the requisite taxes for obtaining their visas. Original article. If you live or travel around Mexico remember US and Canadian auto insurance does not cover once inside Mexico. Buy and print your Non-Mexican auto insurance right from our website in just a matter of minutes. Need Mexican auto insurance this summer? Get a free quote. Buy and print online!